LED- the short form of Light emitting diode. It’s a two lead semiconductor light source. When a suitable voltage is applied through the leads, the electrons and release energy in the form of photons. Alright that’s enough nerdy science for the explanation! To put it simple, its construction and architecture is very different than a regular halogen or tungsten light bulb. That doesn’t mean that its very complicated. LED has always been present in simple electronic devices from very early times. For example there were leds in small record players, circuits, tvs, or small computer devices etc. But today technology has made it possible for LEDS to have a much ‘brighter’ use than just displays. Today they are mostly found in street lights and industrial lighting, but we are going to talk about Automotive usage of LEDs. The most iconic headlight design that took the world by storm, something straight out of a science fiction film or a scifi space craft, as it seemed during the time, was the AUDI R8. A car’s headlight however still had separate bulbs for low beams,high beams indicators. 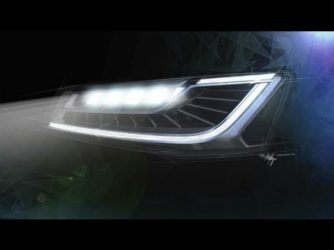 It was only the parking or DRL (day time running lights) that audi introduced to have these LEDs. These LEDs not only looked super cool but was very effective mainly because of its brightness from a distance. 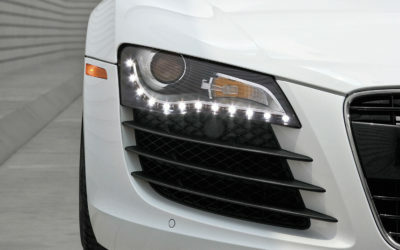 It became a signature for AUDI to use leds incorporated in such a way. But as technology evolved further, car manufacturers began to use LEDs in their main lighting, ie the low beam and high beams. The trend started yet again with German car manufacturers, Audi, Mercedes Benz, BMWs. And from Japan, Lexus also took the idea and used LEDs in main beams of their LS600 from 2009. LEDs have a very long life than regular HIDs or halogens and draws a much less wattage. The brightness to wattage ratio is higher than that of halogens. For example a 20w LED will brighter than a 30w halogen. 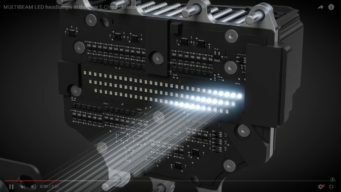 Also the size of led chips allows them to be positioned in very tight spaces, which means car manufacturers can really play around with the architecture of the headlight and use as many LED chips as they want behind a lens. Like the picture above, the LS600 had three projector lenses behind which there were LED chips. So the car’s low beam and high beam can be controlled over a wider range. The LED itself is made up of tiny yellow chips like the picture above. A single piece of LED chip is shown. LED technology allows to change in color as shown. LEDs can be made to any color as desired. In 2016, Merceedes introduced ‘multi-beam’ headlight technology. The photos below are taken from their presentation of Multi beam by Mercedes Benz, and they are pretty much self explanatory. Since LEDs are small chips on a circuit, they can be positioned or arranged in any manner possible and as well as controlled by turning on or off when required. Merceedes benz’s multi beam technology allows these LED chips to be turned on or off when required according to the driving condition. 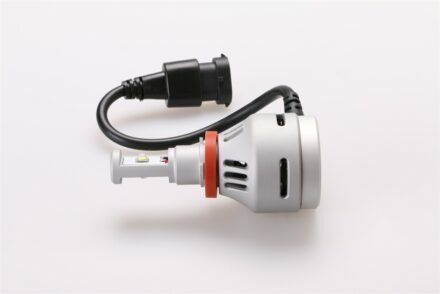 For safety and better lighting performance, the LED chip arranged behind the lens turns off or on and the technology allows the headlight to focus or point at other objects on the road that the driver may have missed. During bad weather the LED chips would point further or in a different direction. All this wizardry comes from the computer that determines the road condition and allows this headlight to focus its beam pattern variably in front of the road. Now that is one crazy technology. Check out this video, you don’t have to be a petrol head or a nerd to understand that all that means! Mercedes explained and presented it best! Moving on from headlights, most of today’s cars now mostly has LED taillights. Another good reason for LEDs to be used in taillights is not just its intensity or brightness but LEDs turn on instantly when current is passed thought. It’s as fast as a camera’s flash, and there is absolutely no ‘delay’ to be ‘lit’ up completely. The application of LED within a light housing’s structure itself makes it much easier for car designers to play around with the looks.So putting everything to conclusion, LEDS are no longer only used in DRLs or parkings but the whole car industry is now turning to use these efficient, cost effective light source. We are saying its ‘cost’effective’ but it isn’t quite in some cases. LEDS have one draw back and that is heat. LEDs might have a longer life span but led incorporated light houssings needs to have a proper cooling system by itself to dissipate the head generated by an LED chip. 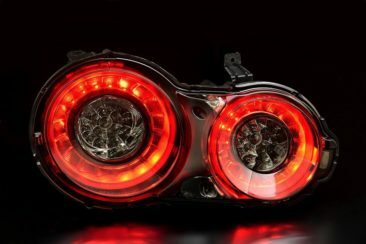 And definitely, the multi beam Mercedes headlight technology indeed took a hell of effort to be made. It’s amazing how automotive intelligence has gained such a feat. 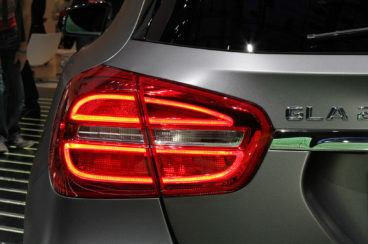 So as the technology is getting much more utilized and efficient, LED lighting can only be found in expensive German cars ? well not really! LEDS are slowly pushing away halogens for a replacement!. Nowadays there are LED replacement bulbs that can also be fixed in a halogen bulb housing. These LED bulbs are having those same small yellow chips that emit light. How many chips placed in the structure and how they are positioned determines the lights intensity and pattern or throw of the light.